Start the day with the Gobble 'n Go 5K! 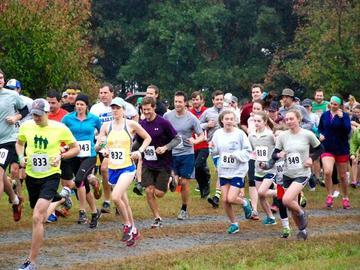 Run through the trails around Basecamp Brewpub & Meadows to support the Nelson County Pantry. All proceeds will go directly to the pantry to support the residents of Nelson County during the Thanksgiving holiday season. Each runner will receive a DB logo glass, sunglasses, a sticker, and a $5 DB gift card just for participating! The first place runner will receive a $50 DB gift card, and second place will receive a $25 DB gift card. Then, The Meadows will open at 11 a.m. for Party-4-the-Pantry! There will be live music all day by Mississippi Leg Hounds, Midlife Crisis, and John Marshal Mays Band. Plus, the bar will be featuring a special hot cider cocktail made with Virginia Distillery Company whiskey. The corn hole tournament kicks off at 1 p.m., and winners will receive a $30 DB gift card. The second place team will receive a $20 gift card. The bear pong tournament begins at 2 p.m., and the winners will receive DB gift cards, too! A $30 DB gift card will go to the winning team, and a $20 DB gift card will go to the second place team. Proceeds from tournament registrations will all go to the the Nelson County Pantry.